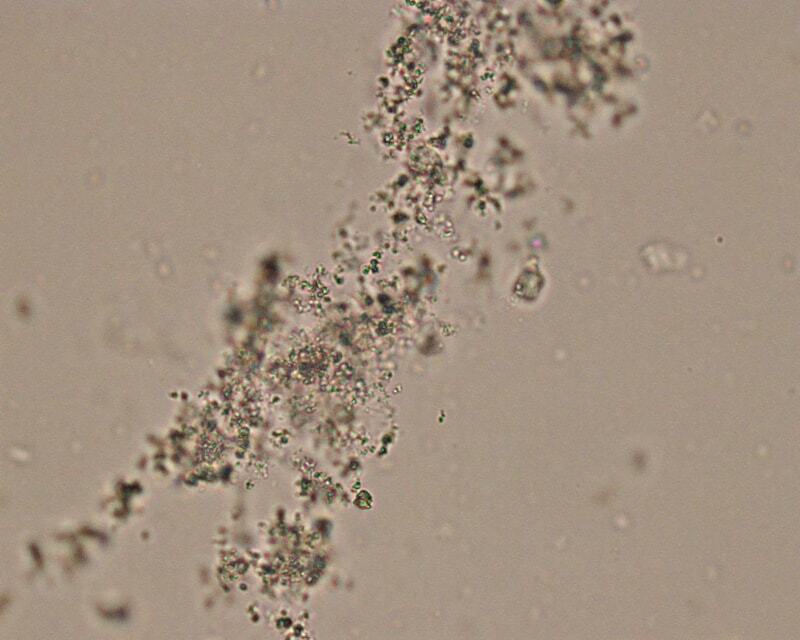 Uric acid crystals invariably form in acidic urine, typically with a urine pH < 5.5. Uric acid is soluble in alkaline urine, preventing the precipitation of urate crystals. The inability of uric acid to crystallize at urine pH > 7.0 is the rationale for urinary alkalinization in patients at risk for acute uric acid nephropathy. Uric acid crystalluria is not associated with significant amounts of hematuria, glycosuria or proteinuria. Although crystals can be seen in certain clinical scenarios, such as kidney stone disease or acute crystal nephropathy, visualizing crystals under the microscope does not guarantee that the crystals were present in the urinary system. Crystals can continue to form after micturition. Crystal precipitation after micturition is most commonly due to changes in temperature, as can occur if the urine is stored at room temperature or in a refrigerator, or changes in urinary pH, as can occur in the presence of infection due to urea-splitting organisms. Uric acid crystals can vary in both size and shape, as can be seen in the slide above. They can look like barrels, rosettes, rhomboids, needles or hexagonal plates. They are usually amber in color, irrespective of the size or shape of the individual crystal. However, urate crystals may assume the color of any pigments (such as bilirubin or the medication pyridium) that are present in the urine. 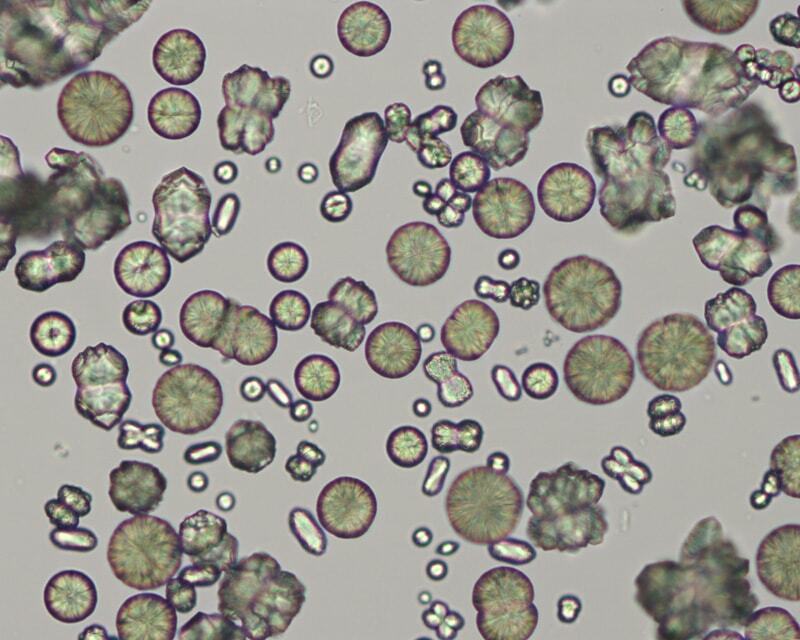 Urate crystals can occasionally be seen in normal subjects, although they are much more common in patients with urate nephrolithiasis or acute urate nephropathy. In contrast to polymorphic urate crystals, cystine crystals are monomorphic, colorless hexagonal plates which look similar to benzene rings. 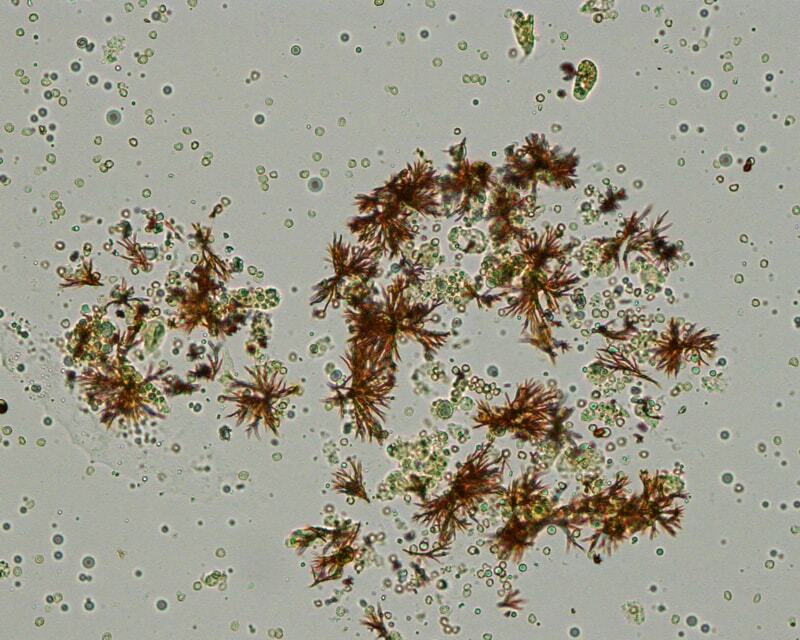 The urine sediments from two patients with cystine crystals are shown above. Cystine crystals may be isolated or may be heaped upon one another. They occur in the sediment of patients with cystinuria, a genetic defect in renal cystine transport. They are found in acidic urine, typically with a urine pH < 6.0. Triple phosphate, or struvite, crystals are described as having a “coffin-lid”-shaped appearance. Several struvite crystals are shown above. Struvite crystals are composed of magnesium ammonium phosphate. They are typically seen in alkaline urine, with a urine pH > 7.0. Triple phosphate crystals are seen in patients with urinary tract infections caused by urea-splitting bacteria, such as Proteus mirabilis, and are frequently found in the urine of patients with infected calculi (struvite stones). 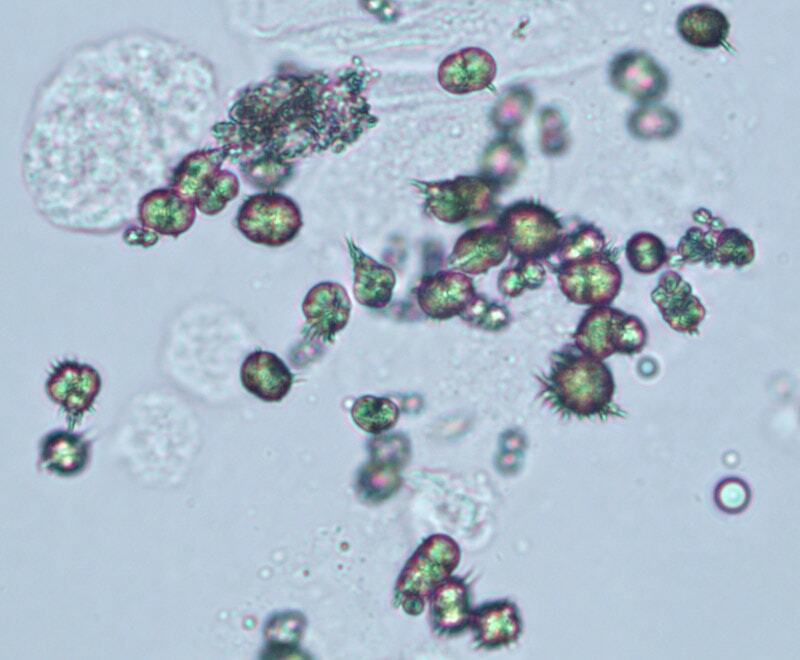 In addition to triple phosphate crystals, microscopy in these patients with urinary tract infections may show significant leukocyturia (arrows, above right) and bacteriuria. Calcium oxalate crystals are usually found in acidic urine. They may occur as either bihydrated or monohydrated calcium oxalate. Calcium oxalate bihydrate crystals appear as colorless bipyramids of various sizes (“envelope form”, above left). Calcium oxalate monohydrate crystals are colorless and can assume several shapes, including ovoids, biconcave disks, rods and dumbbells (above right, yellow arrows). They can be seen in normal individuals with high dietary oxalate ingestion, in patients with nephrolithiasis, and in patients with acute renal failure due to ethylene glycol ingestion. Amorphous urates (Na, K, Mg, or Ca salts) tend to form in acidic urine and may have a yellow or yellow-brown color, rhomboid. Amorphous phosphates are similar in general appearance, but tend to form in alkaline urine and lack color and are Coffin-lid shape. Xanthine crystals are usually in the form of “amorphous” crystals. These crystals occur in Dalmations on allopurinol therapy for urate urolithiasis. Generally, no specific clinical interpretation can be made based on the finding of amorphous crystals. Small amorphous crystals can be confused with bacterial cocci in some cases, but can be distinguished by gram-staining. 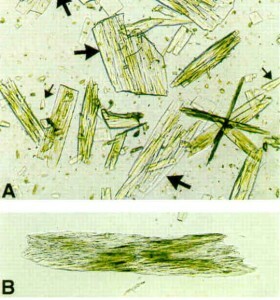 Degenerating crystals or cells can also resemble “amorphous” crystals. Ammonium urate (or biurate) crystals generally appear as brown or yellow-brown spherical bodies with irregular protrusions (“thorn-apples”). In some urine samples, they do not have irregular protrusions but have smooth borders and can resemble calcium carbonate (although these do not occur in the urine from dogs and cats). These crystals can be observed under low magnification, particularly when seen in large number, however low numbers may only be seen at higher magnification. Due to their potential pathologic relevance, crystal identification should be verified by examination at high magnification. Though possible in urine of any pH, their formation is favored in neutral to alkaline urine. They are frequently seen with amorphous urates. These crystals are fairly common in dogs and cats with congenital or acquired portal vascular anomalies, with or without concomitant ammonium urate uroliths. They can be seen in urine from normal Dalmatians and Bulldogs, both of which .are predisposed to urate urolithiasis. They are rarely, if ever, seen in urine from normal cats or dogs of other breeds and have not been reported in large animals. 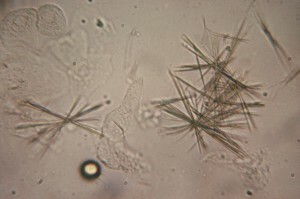 Urinary crystals can also be seen in patients taking certain medications. One example is sulfadiazine: these crystals appear as striated shells or “shocks of wheat.“ A sulfadiazine crystal is shown on the left. Other medications that can cause urine crystals to form include indinavir, intravenous acyclovir, and triamterene. When these medications are given in high doses or to volume depleted patients, the crystals can cause acute renal failure by crystalline blockage of the renal tubules. An example of an indinavir crystal is shown on the right: the top panel shows rectangular plates of various sizes containing needle crystals, while the bottom panel shows indinavir crystals in a sheaf of numerous, densely packed needles. Can oxalate crystals damage the gag layer in the bladder? If so, what type of damage would it cause? I noticed that there are white precipitates on my urine when they were being stocked for a few days but I can’t feel them while I’m urinating, and I don’t know their shape though. is this something serious on my health? My body is actively excreting various crystals through my pores. I see an endocrinologist next week. Some are blue. Some are green. I’m quite certain there are yeast, sulfamide, calcium, and maybe some bilirubin. I have no idea what is going on with me. I took a bath in Epsom salt for the first time in my life 1 month ago and got a Staph infection in my left calf 18 hours later. Presumably there was a salt crystal in there. I’m not sure if my body had a chemical reaction or what has happened. It’s very painful. My legs, arms, chin area, buttocks area are affected as well as being excreted through urine and lower reproductive organs. My tears burn if my eyes get watery. 3 doctors said they’ve never seen it but confirmed visually that there were indeed crystal formations coming out of my body. Can someone help me??? I don’t have diabetes or gout and am not overweight. I’m not on drugs either and I’m not hallucinating or delusional or imagining this. I have had high prolactin levels the past 2 years and sudden weight gain of 25 pounds on my 110 body. 36 year old Caucasian female. You sound like you have Morgellan’s Disease. It’s a very new, man-made disease that few doctors have been educated enough to diagnose. Look it up on Youtube. Hello. I am a Medical Laboratory science student and currently taking up Analysis of Urine and other bodily fluids subject. This site gives me very much helpful informations, yet, just need to provide NORMAL VALUES of this crytals. 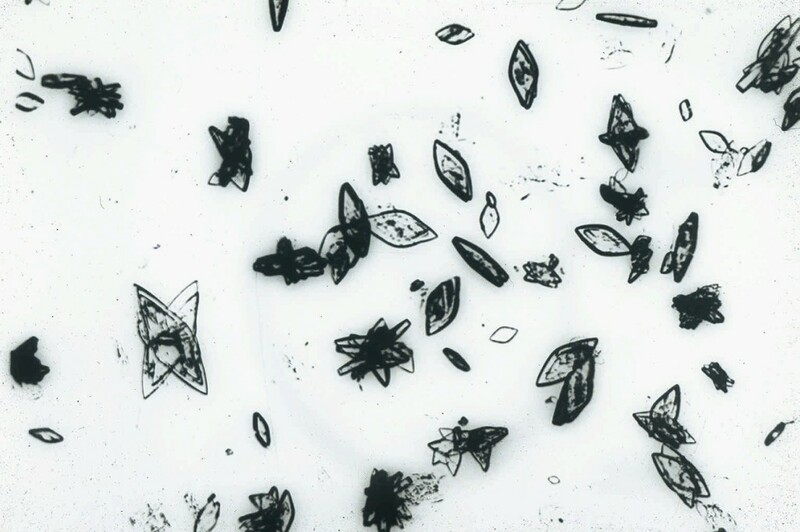 ammonium urate crystals are like adults of Sarcoptes scabeii. i have seen theses crystals in urine, i thinked Sarcoptes scabeii. I feel it will be better if it should be classified into acidic, neutral or basic crystals. I’m not sure what the cost is on this, but well worth the price if you do a lot of micro’s. Hi, i’m Abdullah from one of the Nigeria’s specialist hospital doing my practical attachment, I came across this your blog and am very happy and much appreciated with what you are posting, I really grabbed from what I had never known before. Amorphous urates form in alkaline urine (they are rhomboid in acidic urine), and amorphous phosphates crystals form in acidic urine (they are Coffin-lid shape in alkaline urine). Thank you so much for the correction. Is Calcium phosphate in alkaline urine ? Good work indeed! 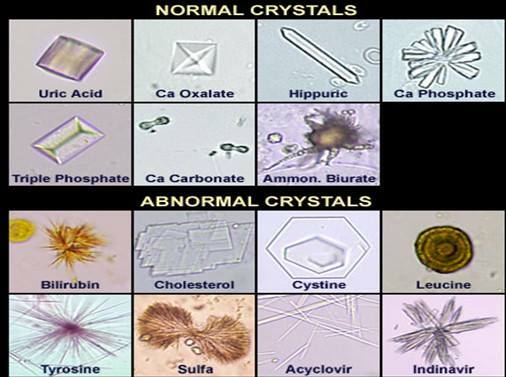 In my about 20yrs experience in the medical laboratory, I have not found some of these crystals in urine microscope. Hi I am impressed your thoughts. Myself ajay kumar verma m.sc microbiologist . Dmlt. Dca . Cleared student. I m in charge a medical laboratory.